We love Rwandan coffees, and believe they have a place in a quality roasters portfolio. They are somehow between the very intense Kenyans and Ethiopians and South/Central Americans. Our Rwandan coffee are tasting completely different from almost anything else from East Africa. They are bright, complex and fruit driven, but yet very balanced and rich. They can typically have flavors of red berries like currant, red grapes, stonefruit and citrus. It’s widely used by our clients both as espressos and filters. Rwanda is known as the land of a thousand hills, and this affects the coffee too. There is a wide range of flavors related to the regions, but even in one main region you will see big differences from hillside to hillside. Our coffees are all well processed, fully washed coffees, mainly of local Bourbon cultivars. It’s from communal privately owned washing stations that are buying cherries from tiny smallholder farmers in high altitudes from 1700 – 2000 masl. And our producers generally separate the lots by local communities and hillsides. We travel to Rwanda several times a year and get to cup through a big range of seasonal micro lots from each producer to make our selection. Then we choose whether we buy the lots separately as micro lots, or mix a few lots from the same producer together to get medium sized lots up to about 50 bags each. We always cup and do pre-selection in origin to calibrate and give feedback to producers, and to have firsthand information of what we are tasting and buying. All coffees are cupped blindly, and properly scored and evaluated before purchase. Our selection is based on a scoring system, where the general cut of is a minimum of 86 points. Lot separation from the individual producers are to be done by days of picking and/or by micro-region in the surroundings of the washing station. The prices we pay to producers is always minimum 50% more than the current Fairtrade minimum prices. We always know what premiums are paid back to the producers. The coffees are always trace able back to a washing station. We are visiting our permanent producers 1 time a year or more. We have full trace ability on stock lots. Price transparency to indivudal small holder farmers will vary as many of the coffees are from communal washing stations, and one batch can be made up from hundreds of farmers. Rwanda is a tiny country with a very dense population. It’s very poor, but yet extremely well organized with hardly any crime or corruption compared to many other countries in the region.. This is of huge benefit for the coffee industry. There is about 500 thousand smallholder coffee farmers. On average they have about 170 coffee trees each. And that’s a tiny production! They normally also do other cash crops like corn, bananas etc. There is about 300 washing stations around the country that are producing fully washed coffees. The rest of the coffee in Rwanda is sold as lower quality home processed coffee. The altitude ranges from 1200 – 2100 masl. Our producers is working in 1700 masl and up. There has been programs in the past through NGO’s like Techno serves coffee initiative that have had huge impact on the way the producers manage trace ability through the supply chain. We believe this is part of the reason why Rwanda so quickly managed to place themselves on the map as a “specialty” coffee producer. The way we source coffee here is based on a model where we partner up with private producers that owe communal washing stations, as well as we have 1 producer with a larger farm (estate). This is a rare and unique thing in Rwanda. The washing stations we buy from is located in the Nyamagabe region in the south close to the town of Huye, and in the western region Nyamasheke alongside Lake Kivu. There are 4 different producers that counts for more than 80% of our Rwandan coffees. We have bought their coffee for years, and have a very close relationship and dialogue on quality, lot separation and product development. The mutual thing across the 4 producers is that they are investing in extra measures to assure quality on everything from picking and sorting to experiments and improved preparations on processing and drying. We also buy experimental lots on shade drying as well as naturals and honey processed coffees. Quality coffee production in Rwanda is a relatively new thing. They started to build washing stations for this purpose in the early 2000. In 2003 they exported the first coffees as “specialty”. Morten Wennersgaard, the founder of Nordic Approach, has been active in sourcing Rwandan coffees since 2007. And we are still buying coffees based on the relationships established at that time. In addition, we have added new producers and relationships to our range. We have also been active in producing Rwandan coffees our selves. Between 2012 – 2015 we spent months on the ground every year taking active part in production and product development. We were instrumental in building a new washing station from scratch, and managed to find ways to increase the selection of quality at the washing station. We found profiles we didn’t know existed, and had an extreme output on the highest grades. Generally, the coffees are a mix of cultivars from the Bourbon family. They have some local Bourbons developed by the research center. The most common is BM 139. Many of the trees are very old, in many cases 50 years or so, but there is also a lot of replanting and new farms. Common cultivars is the Bourbon types BM139, Pop330/21, Mibilizi and Jackson. More seldom is Catuai, Caturra140, and some random typica referred to as Harrare. The producers hardly use, or can afford chemical fertilizers. Many are using organic compost and have developed their own products for plant treatments. 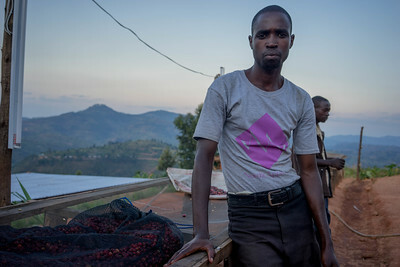 The season for Rwanda can run from March through to August, but for the most part we are finding our selections coming from April to July pickings of the cherry. This can always shift a little depending on the region, weather and the altitude the coffee is being grown at. Farms are generally very small, managed by families that take care of the plants and pick the cherries themselves. Usually they will also have some subsistence farming, there are occasionally farmers with more land. There are normally some hundred smallholder farmers in the local community delivering their cherry to our producers washing stations for processing. Our producers are strict on quality of the cherries delivered by the farmers. If they are not well selected, they normally have to sort out the lower quality cherries before they accept the purchase. Competition for cherry can be pretty tough, farmers can deliver to whichever washing station they want. Maintaining a good supply of cherry is dependent on the relationships between the producer and the small holders. If you want the better qualities you normally have to offer competitive pricing. The producers or managers roots and history in the community normally helps strengthen these relationships. The coffees are generally hand sorted from over-and under ripe cherries after harvested. In some cases they use a flotation system to remove bad and deceased cherries. After this they will be de-pulped, dry fermented, washed in channels and dried on raised beds. The drying can take a while as temperatures can be low as well as they often have small rains during the harvesting season. We work with producers that both use eco-pulpers that saves, and the traditional disc pulpers. We know that we can get fantastic coffees from both methods and set up as long as the producers have a good understanding of how they can take out the potential of the coffees. Theoretically this method can produce “washed” coffees without fermentation as they can remove the mucilage mechanically through a centrifugal washer. Practically our producers still ferment or soak the coffees under water in addition to the mechanical removal of mucilage. Penagos eco pulpers is used to remove the skin, pulp and about 70 – 80%% of the mucilage. The coffee is then wet fermented (under water) for 10-12 hours. After this the parchment is graded and washed in channels, it is normally separated into two grades based on density. In some cases it is again soaked under clean water in tanks for up to 12-20 hours. 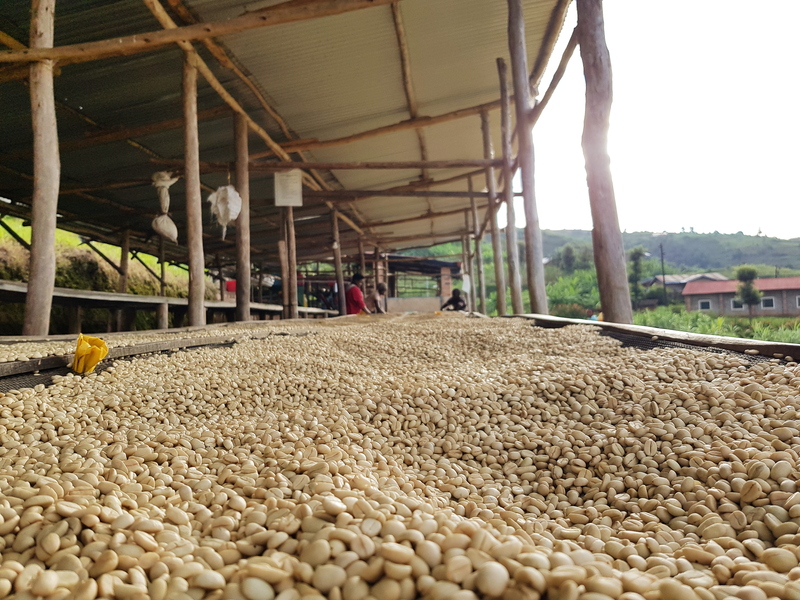 The parchment is initially taken to pre-drying tables, which are under shade, and where while the parchment is still wet, a lot of hand sorting is done as it is much easier to see defects at this point. The climate through most of the season in Rwanda is relatively cool, which assists in controlling the fermentation process. After cherries have been pulped by a traditional 3 disc pulper, removing the skin, pulp and grading the coffees into three grades A, B and C. The coffee is dry fermented for up to 16 hours, depending on the temperature of the climate at the time. The parchment is then washed and graded again in channels, here there are two grades based on density of the bean, then soaked under clean water in tanks for 12- 20 hours. 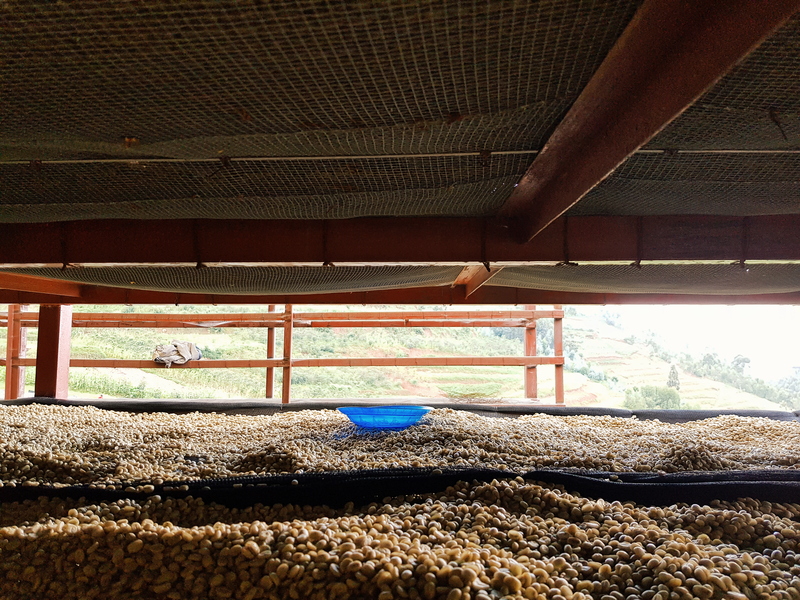 The parchment is initially taken to pre-drying tables, which are under shade, and where while the parchment is still wet, a lot of hand sorting is done as it is much easier to see defects at this point. 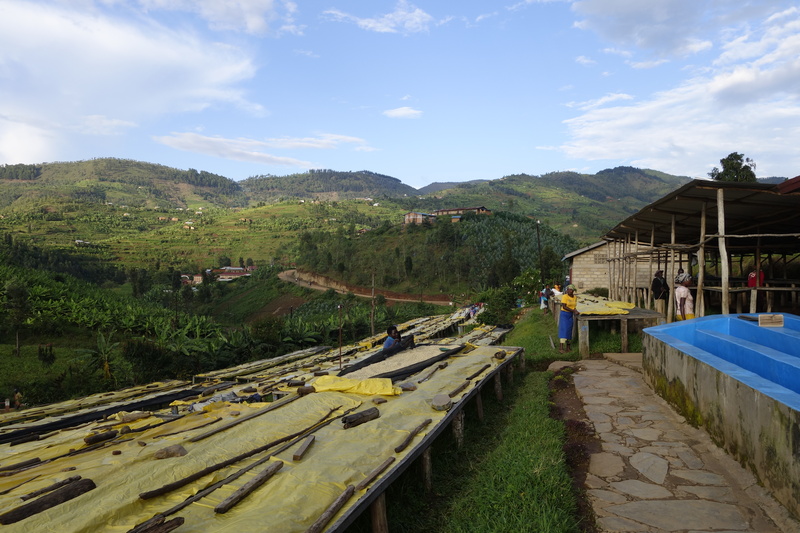 Even if we have some coffees that are dried under shade, most of our coffees are sun dried on raised beds. I would say average drying times for our producers is around 20 days. The climate is relatively cool and stable in Rwanda at higher altitudes, but there are often periods during the harvesting season where there is small rains. This normally increases drying times as they will normally cover them up while it’s raining. Generally they manage the drying by building up the layers of parchment accordingly to the heath and humidity. All our suppliers is constantly moving the coffee throughout the day to get even drying. While moving the parchment they normally also continue to sort out bad and deceased coffee beans. There is a common defect in the coffees from the Great Lakes region that are referred to as the “Potato Taste Defect” (PTD). Our take on this is that there is never a guarantee against any PTD in Rwandan coffees. Not even in the best ones. But they should be very rare. And the coffees are so good, and well priced compared to performance, so if people are aware of what it is it should be manageable. It is also about the knowledge and background for the defect and how it is communicated. It should never be too much of it in our coffees either way. It’s hard and even sometimes impossible to sort out the defected greens after it is processed and dry milled as you can’t really see it. When a coffee are defected it creates a strong taste of raw potato and vegetable flavors. Even if it comes from one bean only it can be present in the entire cup or brew of a coffee. That said, we have limited amounts in comparison to the average Rwandan coffees. All our producers do what they can in the supply chain to minimize the frequency. It will in most cases show up now and then in one cup, but generally never throughout a bag or a lot. It is mainly caused by a small bug called Antestia that feeds on the cherry, and leaves some bacteria that create a metabolic reaction. There is a lot of research going on these days across different organizations and universities. The farmers can reduce the risk by using pesticides, and do very thorough sorting and separation throughout the supply chain. But there is never a guarantee against any affected beans. Usage: Widely used for filters, as single origin espresso and in espresso blends. A musungo introduction to Rwanda | season 2018, June update.